Select the "Proxy Access" option from your SRTE My Page. Select the semester from the dropdown. Check the box(es) for the course(s) you want to grant proxy access to. 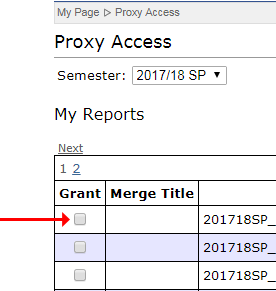 Add the proxy's access ID, the length of time for access, and click the "Grant Proxy Access" button. You will now see that your proxy has access. Access will automatically expire on the end date. If you want to remove it earlier, check the "Revoke" box and then click on the "Revoke Selected" button at the bottom of the viewing area. This system is designed for short-term proxy access. You will need to periodically update the end date for those situations where you want to proxy your results long term.